KALISPELL--It took 15 games, and it came down to a two-out, walk-off single for the Billings Royals to claim the 2018 Montana-Alberta American Legion Baseball Class AA state championship on Tuesday evening, Aug. 1 at Griffin Field. The Royals beat the Lethbridge Elks, 6-5, to claim Post 4's 29th state title in 90 years of MAALB. With the bases loaded and two outs in the bottom of the seventh inning, Billings right fielder Jarrett Leinwand hit a single up the middle to plate the winning run. The Royals' All-State Center fielder/pitcher Brooks Zimmer batted .529; and in two pitching appearances, had a 2.65 ERA over eight innings and earned two victories on the mound to claim the Tournament MVP award. The Royals' All-State second baseman Jayden Kay hit over .471 with two doubles, two triples, and a home run with eight RBIs to earn the Tournament Batting Champ award. **Gamechanger will not be keeping the official pitch count. The official pitch count will be kept on the official hand-kept, hard-copy scorebook. Records current through all games of July 22. Regular Season complete. ** Kalispell earned the No. 2-seed tiebreaker over the Billings Royals, after identical 3-2 victories over each other, with 133 runs scored in the conference season over the Royals' 129. **Missoula earned the No. 5 seed over Lethbridge with its final-day-of-the-season sweep, winning their regular season matchups, 2-1. ** Class AA teams play a 22-game conference schedule. Top 8 teams advance to the state tournament in Kalispell, starting Saturday, July 28. MISSOULA--The defending state champion Missoula Mavericks swept Lethbridge on the final day of the Class AA regular season, and Great Falls won 2 of 3 games down the stretch to improve their seeds into the 2018 state tournament. The state tournament starts Saturday, July 28, in Kalispell. No. 1 Bozeman plays No. 8 Great Falls at 10 a.m. No. 2 Kalispell plays Helena at 7 p.m. following the opening ceremonies. The No. 3 Billings Royals will play No. 6 Lethbridge at 4 p.m. The Nos. 4-5 game will be at 1 p.m. with Missoula and the Billings Scarlets. Bozeman (16-6) locked in the No. 1 seed last week. Kalispell and the Billings Royals (15-7) tied, and exchanged identical 3-2 victories over each other in their two-game regular season series. So the tiebreaker went down to runs scored in all games. Kalispell won that 133-129 for the No. 2 seed. The Billings Scarlets were the only other team to finish above .500 with a 14-8 conference record to earn the No. 4 seed. Missoula and Lethbridge each finished the conference season at .500 with 11-11 records. The Mavs won their season series, 2-1, with a final-day-doubleheader sweep over the Elks to earn the No. 4 seed. KALISPELL--One thing's for sure in Class AA MAALB this year: There's a lot of parity... especially if everybody's ace is pitching (like in the opening round of the state tourney). b). If teams split the conference games, the total runs scored in all games by the teams shall decide the winner. Heading into the final weekend of conference play, there are two teams with 13 wins (Nos. 2-3 Royals and Lakers), two with 10 wins (Nos. 4-5 Scarlets and Elks), and two with nine wins (Nos. 5-7 Mavs and Senators). Medicine Hat and Great Falls are each 8 games behind first place, fighting for the coveted No. 8 seed. BILLINGS--After having no games since July 3, Tuesday saw a lot of Class AA action and a shake up of the standings. The Billings Royals swept Medicine Hat to improve to 12-5 on the season and take a half-game lead over Bozeman (11-5) for first place. Bozeman plays third-place Lethbridge (9-5) in a doubleheader on Wednesday. The Kalispell Lakers swept the Billings Scarlets to improve to 8-6, good for fourth in the standings. The Scarlets dropped into a tie for fifth place with Missoula at 7-6. Missoula split a doubleheader with Butte (2-11). And Lethbridge split a doubleheader with Helena (7-9). With less than two weeks left in the regular season, there is looking to be a fight for the No. 8-seed berth into the state tournament with three teams within 1 1/2 games of each other. BUTTE--The Billings Scarlets completed a 3-game sweep over the Butte Miners and the Great Falls Chargers swept a pair from the Helena Senators on Tuesday, July 3. 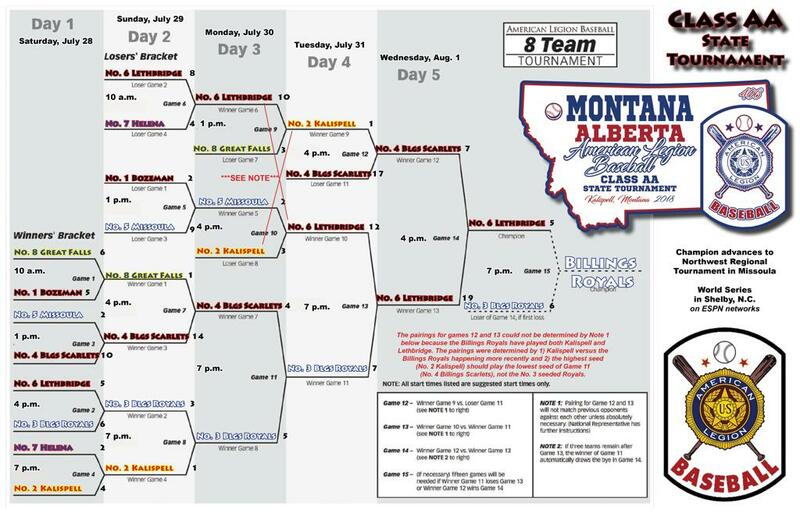 The victories improved the Scarlets to fourth place in the Montana-Alberta American Legion Baseball standings. The Chargers improved to 4-9, and are one game behind the Medicine Hat Moose for a berth into the Class AA State Tournament in Kalispell, starting July 28. BILLINGS--The Billings Scarlets corner infielder A Seward hit a two-run single in the second inning, and pitchers A Larson and D Johnson each helped their causes on the mound with two hits and an RBI apiece, Saturday, June 3, to help lift the underdog Scarlets over their crosstown rival Royals, 4-2. The victory was the third straight for the Scarlets, who swept Missoula on June 27, to vault up to .500 on the season--and the fifth spot in the standings. Bozeman (11-5) is in first place, a half game ahead of both the Lethbridge Elks (7-2), who swept Kalispell on June 24, and the Billings Royals (9-4). Missoula (6-5) is a game above .500 in fourth place. Monday, June 18, proved to be an off day for Montana-Alberta Class AA American Legion Baseball. It was the only one in a string of 16 straight days. In the span of four days, Bozeman won six conference games and tied the Billings Royals at 9-2 atop the standings, about halfway through their conference seasons. Kalispell is three games above .500 in third. Lethbridge is two games above .500 in fourth. Missoula is a game above .500 in fifth. They are all about one-third of the way through their conference seasons. Rainouts across Montana have caused rescheduling. The Billings Royals, Billings Scarlets, Butte and Helena have all had to reschedule games. Check the schedule and results below on this page, or the game schedules tab (work in progress) above. BOZEMAN--The Bozeman Bucks swept previously-unbeaten Kalispell Thursday, and Medicine Hat got its first win of the conference season over previously-unbeaten Lethbridge on Wednesday, to mix up the top of Montana-Alberta Class AA American Legion Baseball standings. Bozeman (6-1) vaulted into No. 1 in the standings about one-third of the way through their conference schedule. The Billings Royals (9-2) sit No. 2 about halfway through their conference season. Lethbridge (4-1) and Kalispell (5-2) are Nos. 3 and 4, respectively, about a quarter of the way through their conference seasons. Missoula (4-3) is a game above .500 in fifth. BOZEMAN--Bozeman second baseman Michael Freund went 3-for-4 with a double, two RBIs, and a stolen base, and pitcher Adam Hubley spread three hits and a walk over five innings while walking one, to help lead the Bucks to an 11-1 victory over the Billings Royals on Saturday, June 9. Two days before on Thursday, Missoula pitcher Dylan Chalmers allowed just six hits and a walk over seven innings, and a Billings fielding error led to a decisive two-run sacrifice bunt play in the third inning, as Missoula beat the Royals, 4-2. The losses were the Billings Royals' first two losses of the Montana-Alberta Class AA American Legion Baseball season. They did rebound by taking the second game of a doubleheader against Bozeman on Saturday to improve their conference record to 8-2. The Kalispell Lakers have started the conference season with doubleheader sweeps over Missoula and Medicine Hat at home and are 4-0. Lethbridge is also unbeaten at 2-0. Bozeman is the only other team above .500 in the standings at 2-1. MISSOULA -- Billings catcher J Leinwand went 3-for-5 with a double and four RBIs to help lead the Royals to a 14-3 victory over Missoula on Wednesday, June 6, to help improve the Royals to 7-0 in Montana-Alberta Class AA American Legion Baseball play. While the Royals are one-third of the way through their confernce season, no other team has more than three conference games played so far (except Great Falls with five). Lethbridge swept Great Falls and Kalispell swept Missoula in doubleheaders this week to open their conference seasons at 2-0. Leinwand is hitting .433 with 11 doubles, two home runs and 26 RBIs. The Royals are 20-1 overall on the season. Three of their starting pitchers are 5-0 with 32 innings pitched apiece. Zimmer has 47 strikeouts, Torgerson has 43 Ks, and Frieders has 34. 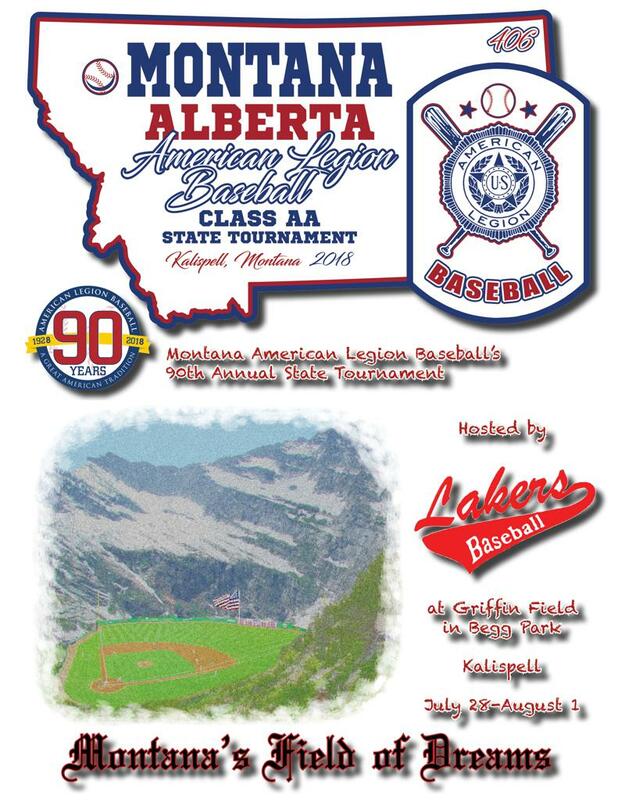 Montana-Alberta Class AA American Legion Baseball teams will play a 22-game conference regular schedule. The top eight teams after the regular season will advance to the state tournament in Kalispell. Day 1 of the state tournament is Saturday, July 28. MAALB teams will play their old Eastern AA/Western AA rivals three times while playing the other opponents just twice. The old alignment was Western AA: Missoula, Kalispell, Great Falls, Lethbridge, and Medicine Hat; Eastern AA: Billings Royals, Billings Scarlets, Bozeman, Butte, and Helena. New this year, all games at the national-qualifying (state) tournament will be seven-inning games. Also new this year, the maximum pitch count per day is 105. The MAALB state champion will qualify for the Northwest Regional Tournament in Missoula. If Missoula wins state, the state runner-up will qualify for the regional as well. The regional tournament champion will advance to the ALB World Series in Shelby, N.C.